Amazon: Wilton Master Decorating Tip Set Just $29.99 (Regularly $62.11) – Today Only! Head to Amazon.com where today only you can score this Wilton Master Decorating Tip Set for just $29.99 (regularly $62.11) with FREE Super Saver Shipping! This set includes 55 decorating tips, standard couplers and flower nails plus a plastic tip saver case for storage. 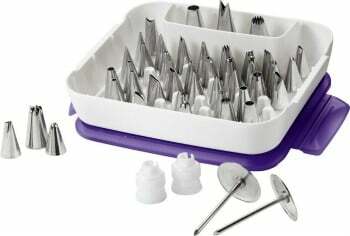 A Tip Set worth Getting for the Serious Baker!!! This Amazon best bargain of the day is valid April 28 only and while supplies last.